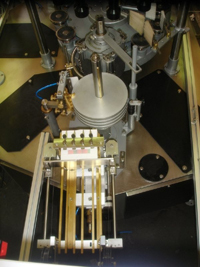 In-line labellers can apply a patch label or a wraparound label depending on the label length. For slow speed labelling of bottles with more than one label, Enterprise Tondelli can supply a rotary labeller without the traditional glue pallets. This universal type machine can apply labels of varying sizes with few label handling change parts. The traditional glue pallets are replaced by a glue transfer drum and an oscillating label magazine. This type of labeller is especially suited to slow speed labelling of a wide variety of containers and label sizes as used by a contract packer. This means that for a new contract the packer would not need to invest in time consuming and bespoke change parts but can use universal la bel parts. Three label stations can be located on the carousel predicting a very flexible labelling normally associated with the discontinued manual “pony” labellers. A key feature of the high speed labelling is the label pallet movement geometry. The label pallet is mounted on a differential gearbox that is designed for slow speed label pick up/application and continuous rotary motion. 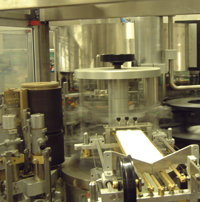 The slow speed label pick up from the magazine and then slow speed label removal by the picker finger drum ensures gentle label handling with the label accelerating as it transfer round the pallet carousel. This feature is especially useful when foiling. Another benefit of this system is the need for less label pallets as continuous motion pallets can achieve higher speeds thus reducing change parts costs. Bottle orientation for handles, embossing etc can be achieved by the traditional base notch and side spotting devices. 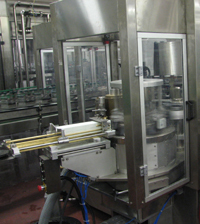 Alternatively individual servo motors located under each bottle platform can perfectly orientate the bottle with optical spotting precise bottle orientation. With a very long experience and different solutions to the different cold glue labelling challenges, Enterprise Tondelli can meet your specific requirements.